What’s the first thing you do after buying an ice cream maker? If you’re me, you put your favorite protein shake in it, and see how it comes as ice cream. It’s amazing, by the way! 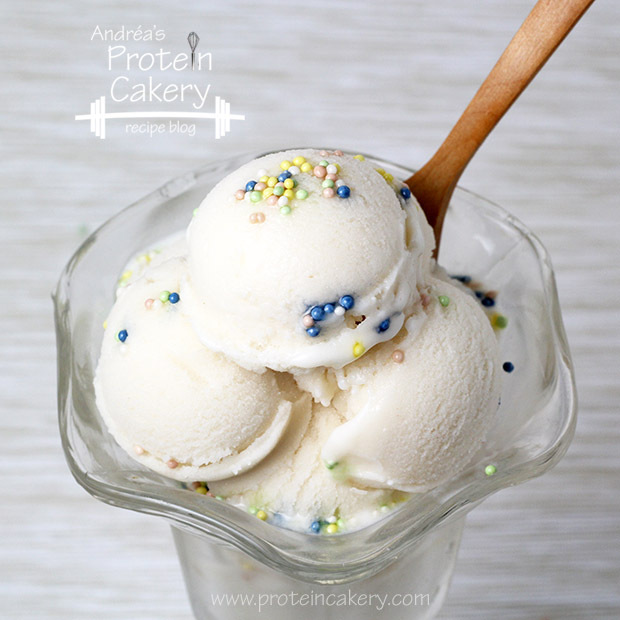 This Cake Batter Protein Ice Cream is heavenly! My favorite shake lately is super-simple: Jamie Eason’s vanilla whey isolate (all-natural, and tastes like cake batter!!) and unsweetened almond-coconut milk. So delicious together! And if you don’t overdo the liquid, the shake comes out so creamy. I knew it would be great as ice cream! I recently bought this ice cream maker, and it’s pretty awesome. The container gets pre-frozen, and it only takes about 10 minutes to make this Cake Batter Protein Ice Cream! 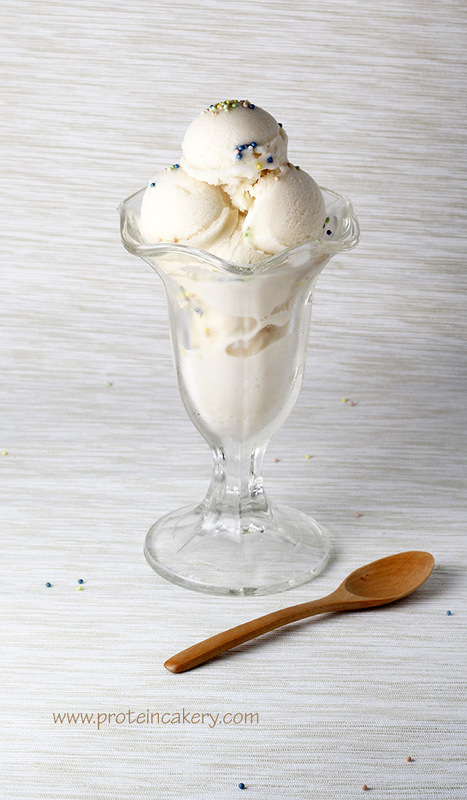 If you don’t have an ice cream maker, though, you can still make this. It’ll just be a little less fluffy. Also, keep in mind that when stored in the freezer, this ice cream will freeze much more solid than packaged, traditional ice cream. You’ll need to let it sit out for a bit to soften. I use this container to store my protein ice cream, which makes scooping easier when it is still quite firm. Yeah, so, cake batter! I love this protein powder. The team at Labrada sent over the first bag, but I’ve been buying it since because I love it for pre- and post-workout. I love the whole Jamie Eason line of protein powders, actually. They taste great, and I bake with them often. I also used them for several of the protein popsicle recipes in my new ebook. Labrada gives a discount when you buy a second bag of powder, and you can get a free shaker on orders over $50 at Labrada.com with code: SHAKEITUP ! It’s a pretty cool shaker, too, with extra storage compartments for dry powder and pills. 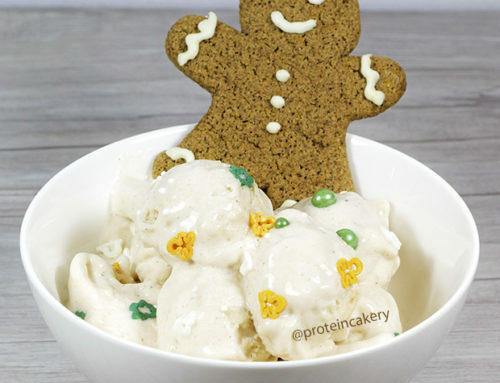 Anyway, enjoy your Cake Batter Protein Ice Cream! Shake or blend the milk and whey. Top with sprinkles, and enjoy! A note about substitutions: If you want this to taste like cake batter, you have to use protein powder that tastes like cake batter. So I wouldn't sub other powders for this one. (There are other brands out there with artificial flavors and sweeteners, but this protein is all-natural!) In terms of texture only, you can use any whey that would be creamy. If it makes a creamy shake, it should make a creamy protein ice cream! And you can substitute any kind of milk here. Also, keep in mind that when stored in the freezer, this ice cream will freeze much more solid than packaged, traditional ice cream. You'll need to let it sit out for a bit to soften. I use this container to store protein ice cream, which makes scooping easier when it is still quite firm.